« to tattoo or not to tattoo? 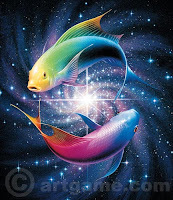 OVERVIEW: Pisces thrives through creative transportation and unique social experiences. There will be changes in the way you develop your inner-self, this year. Your ability to multitask will continue, as you become involved in more humanitarian projects. You have tremendous vitality and courage, and a healthy sense of who you are. You usually put your best foot forward, and are possessed by an innate charm and magnetism. You love being physically active, usually with others. You learn to take more responsibility by being diplomatic and tactful. Your capacity for childlike wonder is a wonderful creative outlet. Sometimes, you may feel an unconscious pull toward an objective or goal that you do not fully understand. You also may be tempted to participate in many activities just to be involved for the social aspects of being around fun-loving people. Your task is to attempt to make conscious choices in these areas, and to become more aware of your true objectives based on your own values and goals, independent from the approval of others. Find happiness by connecting with your higher self, and by helping people to move closer together. CAREER: You are very attracted by variety in your career and enjoy having a profession in the arts. You have a natural grace and compassion working with people, and they appreciate and respect your help and wisdom. Your creative imagination needs to be indulged when you take the time to meditate and recharge your emotional energy. You love expanding your consciousness and passionately desire to bring your higher ideals and visionary philosophy to mainstream. Travel and the exploration of your utopian ideals help to bring your vision and work to the world. You have a great passion for using your dreams to reflect truths about reality and a natural ability to teach and share with others. This year will be about learning the best ways to direct this energy to help others. Your insight is grounded in reality and you create harmony in your work, mainly because of having the same purpose and visions as those you collaborate with. For this reason, it is important that the people you surround yourself with share a collective vision and goal. By the end of the year, you may go through many internal changes in the course of pursuing your vision. You are a real powerhouse, and enjoy being your own boss. LOVE: Having love, spiritually and security in your relationship is one of your most intimate goals. You are very sensitive to what others say and do. Your emotions and intuition help you translate your sensitivity into compassion through your mystical approach of uniting with another on a higher level. Draw from your intuitive abilities to make good and decisions in all areas of your life. You feel as if you have a high spiritual calling when it comes to marriage, and relationships in general. Your sweet intensity, charm and attractiveness lure others to you. This is especially promising around the summer, when you become very interested in the possibility of settling down and having children. Emotional security is a big thing for you and throughout the year you experience many life lessons through your relationships. Your strong capacity for joy and giving deepens your relationships and creates loving harmony and balance. Your urge to be devoted to your partner is strong, yet sometimes it’s hard to learn to become more emotionally detached so you can rely on your inner strength during stormy times. It is important for you to have someone that appreciates your mystical wisdom and attitudes; otherwise, you become restless and overly sensitive. You are a naturally intuitive person and see things from a perspective that others may not. The challenges you may experience in your love partnership will mainly be around learning to integrate and balance your own growth and create more harmony in your relationship. You will deepen your connection as the year unfolds, and learn to take responsibility for your own feelings. PERA: Food allowance na lang pera mo, magbabayad ka pa ng liempo, ano nang mangyayari sa iyo.